Annotation: Never forget how close you are to your goals with the Parade of Elephants chart seals. 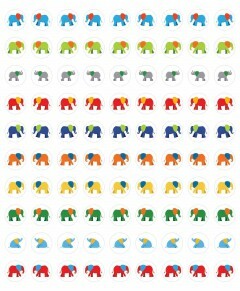 These cheerful elephants are sure to make progress tracking fun! These self-adhesive chart seals are acid-free and lignin-free. Each pack includes 810 seals that are 3/8" in diameter. Available in a variety of colors, shapes, and designs, chart seals are an excellent addition to any teacher's desk. Look for coordinating products in this design to create an exciting, cohesive classroom theme!